Air leaving a compressor is hot, dirty, and wet—which can damage and shorten the life of downstream equipment, such as valves and cylinders. Before air can be used it needs to be filtered, regulated and lubricated. The staff at Brown Engineering has the knowledge and the experience to help you to select the perfect FRL for your system! An air line filter cleans compressed air. It strains the air and traps solid particles (dust, dirt, rust) and separates liquids (water, oil) entrained in the compressed air. Filters are installed in the air line upstream of regulators, lubricators, directional control valves, and air driven devices such as cylinders and air motors. Filters remove contaminants from pneumatic systems, preventing damage to equipment and reducing production losses due to contaminant related downtime. Downtime in an industrial plant is expensive; often it is the result of a contaminated and poorly maintained compressed air system. Selecting the proper size of filter for any application should be done by determining the maximum allowable pressure drop, which can be caused by the filter. 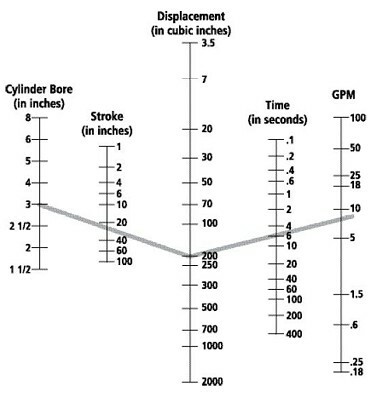 The pressure drop can be determined by referring to flow curves provided by the manufacturer. Regulators reduce and control fluid pressure in compressed air systems. 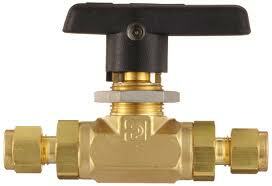 Regulators are also frequently referred to as PRVs (pressure reducing valves). Optimally, a pressure regulator maintains a constant output pressure regardless of variations in the input pressure and downstream flow requirements. In practice, output pressure is influenced to some degree by variations in primary pressure and flow. Pressure regulators are used to control pressure to: air tools, impact wrenches, blow guns, air gauging equipment, air cylinders, air bearings, air motors, spraying devices, fluidic systems, air logic valves, aerosol lubrication systems and most other fluid power applications. Regulators have a control spring which acts on a diaphragm to regulate the air pressure. The rating of this control spring determines the pressure adjustment range of the regulator. General purpose regulators are available in relieving or non-relieving types. 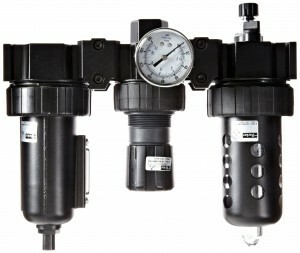 Relieving regulators can be adjusted from a high pressure to a low pressure. Even in a dead end situation, relieving regulators will allow the excess downstream pressure to be exhausted. This causes a loud hissing sound which is perfectly normal. Non-relieving regulators, when similarly adjusted, will not allow the downstream pressure to escape. The trapped air will need to be released in some other way, e.g. by operating a downstream valve. Downstream equipment flow and pressure requirements must be determined to properly size the correct regulator for the application. 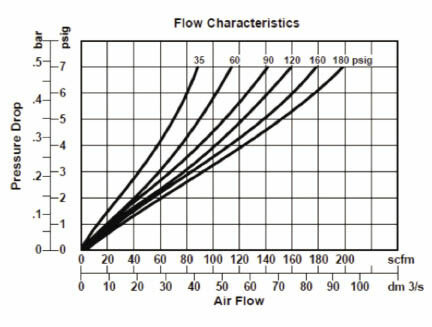 Manufacturers offer flow characteristics charts on their products to help chose the correct regulator. Lubricators add controlled quantities of oil into a compressed air system to reduce the friction of moving components. Most air tools, cylinders, valves, air motors, and other air driven equipment require lubrication to extend their useful life. The use of an airline lubricator solves the problems of too much or too little lubrication that arise with conventional lubrication methods such as a grease gun or oil. Once the lubricator is adjusted, an accurately metered quantity of lubricant is supplied to the air operated equipment and the only maintenance required is a periodic refill of the lubricator reservoir. Adding lubrication to a system also “washes away” compressor oils that travel through the system in vapor form. Mineral oils added to the system prevent synthetic compressor oil build-up on system components. 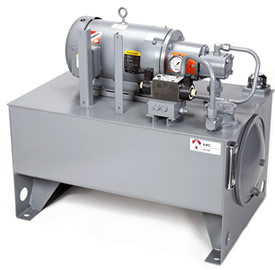 When lubricators are not used in a system, a coalescing filter should be installed to remove compressor oil aerosols. Lubricators are sized by downstream flow requirements. An analysis of air flow use must be made. 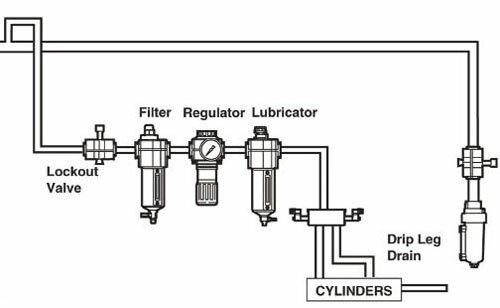 After determining how much air flow is needed, a lubricator can be chosen. Manufacturers’ curves will be similar to the one shown in the example above. First decide if you want to regulate the flow direction or flow speed. If you want to control the flow of direction you need a directional control valve that controls the air flow direction or inhibits the flow altogether. Whereas, if you need to regulate the speed, you need a proportional valve that controls the flow rate at which air flows down a given path. Check out how many inputs and outputs that your directional valves have. Make a total of them that gives you an idea of how many openings you need to have. Normally there are three openings in common directional valves one for input and two for outputs. One side would extend the piston the other would contract it. You may have an application that needs more switching positions (other than expanding and contracting the piston) but don’t forget the number of switching positions only controls the number of options available for paths the air can travel, it does not control the flow. For controlling the flow, you will then need another valve. In case you need more switching valves, you would select the valve that could handle the flow control in another way. Determine the valve’s inside pressure and make sure the selected valve can handle the pressure correctly. A valve that cannot handle the pressure will break quickly and may become an expensive mistake. Many industrial applications require linear motion during their operating sequence. One of the simplest and most cost-effective ways to accomplish this is with a pneumatic actuator, often referred to as an air cylinder. An actuator is a device that translates a source of static power into a useful output motion. It can also be used to apply a force. 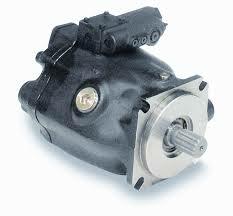 Actuators are typically mechanical devices that take energy and converts it into some kind of motion. That motion can be in any form, such as blocking, clamping, or ejecting. There are many styles of pneumatic actuators including diaphragm cylinders, rodless cylinders, telescoping cylinders and through-rod cylinders. 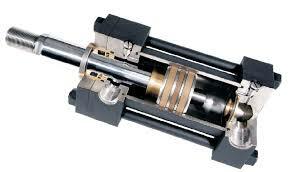 The most popular style of pneumatic actuator consists of a piston and rod moving inside a closed cylinder. This actuator style can be sub-divided into two types based on the operating principle: single acting and double acting. Single-acting cylinders use one air port to allow compressed air to enter the cylinder to move the piston to the desired position, as well as an internal spring to return the piston to the home position when the air pressure is removed. Double-acting cylinders have an air port at each end and move the piston forward and back by alternating the port that receives the high pressure air. In a typical application, the actuator body is connected to a support frame and the end of the rod is connected to a machine element that is to be moved. An on-off control valve is used to direct compressed air into the Extend port while opening the Retract port to atmosphere. The difference in pressure on the two sides of the piston results in a force equal to the pressure differential multiplied by the surface area of the piston. When selecting an air cylinder, it is important to properly match the cylinder to the application, particularly in terms of required force. The theoretical force available in the actuator is the piston surface area multiplied by the supplied air pressure. Spring force must be subtracted from this value for single acting cylinders. The actual force applied to the load will be 3 to 20% less due to pressure losses in the system. Brown Engineering provides a perfectly fitting and cost-efficient installation solution for every task We offers many lines of couplers, hoses, tubes, and fittings that either meet or exceed industrial specified requirements. Let our experts help you select the right one for your needs. Mechanical devices used in static or dynamic applications to separate two liquids or gasses or prevent the ingress of contamination. 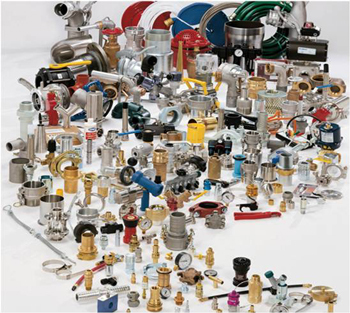 Brown Engineering can provide you with access to many pneumatic vacuum product lines. 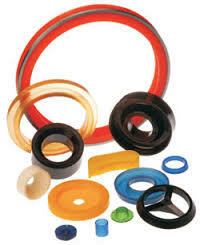 We provide customers with a comprehensive range of vacuum components for all types of markets and applications. The product range includes a large selection of vacuum generators (ejector & venturi and electric vacuum pumps), suction cups, mounting elements, spring plungers, sensors & switches, filters, and various accessories. Ctesibius of Alexandria was a Greek physicist and inventor. The discovery of the elasticity of air is attributed to him, as is the invention of several devices using compressed air, including force pumps and an air-powered catapult. 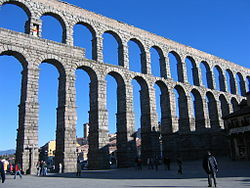 Ctesibius’ writings have not survived, and his inventions are known only from references to them by Vitruvius and Hero of Alexandria, but he laid the foundations for the engineering tradition and is considered the father of pneumatics. 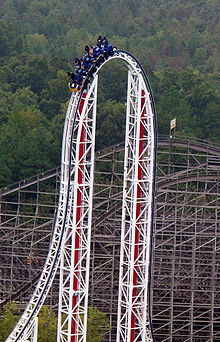 Compress-air catapults are used in many applications today, for example this Japanese roller coaster uses one to launch the coaster up this steep incline in the track! Hydraulics deals with the mechanical properties of liquids or fluids. At a very basic level, hydraulics is the liquid version of pneumatics. In fluid power, hydraulics are used for the generation, control, and transmission of power by the use of pressurized liquids. 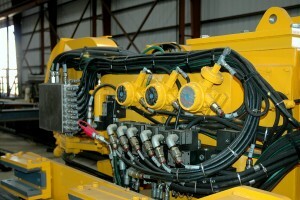 From the hydraulic fluids themselves to all the parts of hydraulic systems, Brown Engineering has everything necessary to create or repair the system you need. Some common applications of hydraulics used by our customers include: machine tools, automation, meat-processing machinery, rolling mill machinery, material handling, agricultural equipment, paper mill machinery, industrial processing, and construction equipment.